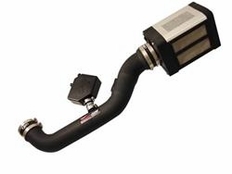 There are several brands out there when it comes to aftermarket air intake systems, but Injen leads the way in innovation, efficiency, and power gains. Injen PowerFlow Intake Systems are more than just a high flow air filter on a less restrictive tube. Featuring Injen's patented MR Technology, Injen incorporates a step process into their intake tubes (meaning they increase or decrease the diameter of the intake tube at strategic points to control airflow). This, coupled with the fact that Injen Power Flow Intakes incorporate your existing sensors, mean you won't have any check engine lights and it is safe for use on your vehicle. At the end of the Injen PowerFlow Intake is the Injen Power Box. In addition to providing additional filtration and heat protection, the Power Box houses a high flow Injen air filter that can be cleaned and reused for as long as you own the vehicle. An air stabilizer and incorporated velocity stack smooth out airflow to help maximize power gains. Comprehensive installation instructions including photos make installation of your new Injen Intake easy enough to do yourself with basic hand tools in under an hour. The part number for this item is PF1959P or PF1959WB (depending on the color) and fits 2005-2015 Nissan Frontier / Nissan Pathfinder 4.0 V6 models. This Injen Power Flow Intake is 50 State street legal for most years. If you are in California, a SMOG technician may ask you for a CARB EO number proving this intake is California emmissions approved. The CARB EO Number for this intake is: D-476-6 This EO number should already be stamped on your Injen Intake unless the sticker has fallen off or was removed.